I’m going to be doing something new here at least for the next month, and I will see how you (the readers) like it and if I find enough to write about. Basically I will be making this blog a log of my personal workouts, eating, etc for the month of January every few days (my goal would be to write every day I workout, but I don’t think I will get around to writing daily). In each blog post I will try to cover one topic specifically (which will be in the title) in short, and then I will also go over my daily workout or anything I feel like writing about. So to give you an example, today I feel like writing about “How to do a lat pulldown properly” because when I was at the gym today I saw someone doing it with awful form (which is normal for pulldowns). I will go over how to do a lat pulldown properly, and then below I will just talk about my personal workout stuff. For those who don’t know, a Lat Pulldown is a back exercise performed on a cable machine with the bar starting overhead with a wide grip and you are pulling the body towards your chest while activating and squeezing your back muscles (mostly your lats). While working out today I saw someone doing lat pulldowns with terrible form, and I’m sure a few of you reading this article do the same thing with your pulldowns (because I see it a lot at the gym). The kid had the basics of the pull down fine, which is pulling the bar towards your chest. But where he went wrong was with his tempo. He would struggle getting the bar down to his chest, and then instead of slowly returning to the top position (the eccentric portion of the lift) he would basically drop all of the weight at once, which would pretty much fling him up and off his seat. He was getting no benefit from the eccentric part of the pulldown, which is the part of the lift that will really help you get stronger and grow your lat muscles. So how do I perform a proper Lat Pulldown? The first thing you want to do is start with your arms fully extended at the top. Under control bring the bar to your chest (or as close as you can get) while focusing on pulling your elbow into your side and squeezing your lat muscles at the same time. It also really important that you are sitting almost straight up (and not leaning way back like a lot of people will do). This will help keep the focus on your lats and not your mid back (you can use another exercise for that). When you get the bar to your chest try and squeeze for a quick second, and then slowly bring the bar back to the starting position. This part of the lift should be 2-4 seconds. 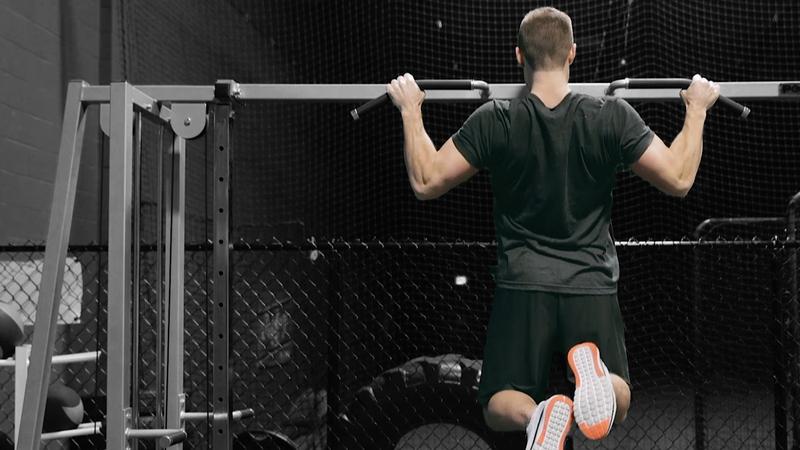 Once the bar gets to the top again and your arms are fully extended you repeat the movement. Make sure your shoulders are pulled back throughout the exercise as well. 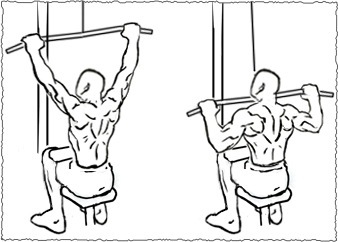 The Lat Pulldown isn’t a very complex exercise, but you will often see many people doing it wrong, cheating, etc. If your goal is strength and size for your lats you are best off performing the exercise under control with lower weights and focusing on activating your lats throughout the movement. OK so today was my first day back in the gym in the new year, as I took some time off over the holidays. I got right back into it with a lower body and core day, but I had to take it somewhat easy because I barely did much lower body lifting over the break. I try not to lift lower body when I have a hockey game or when I’m doing my pick up basketball/football games, so that lead to skipping lower body a few times. Now that I’m getting serious about my training again, I won’t be skipping my lower/core days for anything as they are the workouts that are the toughest, and will help me reach my cutting goals for the month. Today I went light with the weights, but I had a good sweat going as I kept most rest times to 60 seconds. I did some trap bar deadlifts, followed by 1 leg squats holding a ten pound plate. I followed that up with straight leg deadlifts and front leg kicks (stretching the hamstrings). Next I did some light calf work focusing on good form, and I definitely felt the burn big time with those. That was it for my lower workout, and I went right into core. I started with front leg raises with 30 seconds rest, and then went into stability ball “reverse crunches”? I’m not sure if that’s the proper name for the exercise, but it is where you have your hands on floor and feet on a stability ball and bring your knees to your stomach. Lastly I finished off with 1 minute planks and a nice stretch. I should have done some cardio, but I will save that for tomorrow as my legs were tired going through my first real lower workout in a while. Today my eating has been great so far (posting this at 4:30 PM). I had a carton of egg whites plus one whole egg with three pieces of turkey bacon for breakfast. I followed up my workout with a post workout shake (two scoops Monster Milk, ice, peanut butter) plus 1 hard boiled egg (only half of the yolk). Soon I’m going to be eating my dinner which will be a chicken and spinach salad. Tomorrow afternoon I’m taking my girlfriend for a “date night” to a casino that is about a 2 hour drive from where I live. It is a nice hotel, so we will just drive down do a bit of gambling and we have reservations for their steakhouse which is supposed to be good. Because of that I won’t be writing a post here, but maybe I’ll get one up on Sunday (I plan on working out Sunday morning). I’ll be doing a back and shoulder workout tomorrow with some cardio at the end before we leave sometime in the morning. I plan on packing some healthy snacks for the car ride, and maybe some stuff for later in the night. I’m also going to try and eat a healthy breakfast in the morning at one of their restaurants, so I shouldn’t have to eat too bad while I’m not at home. Anyways have a good weekend, and leave a comment below if you like these kind of posts where I talk about my daily routine. Is it fine if my bottom is not 100% planted on the seat as I’m lifting the weight, or is that considered poor form? I’m not coming all the way off. But I find that if lift a weight such that I keep myself firmly planted on the seat then it doesn’t feel as though my upper back is getting much benefit from the exercise. You should be seated throughout the whole movement. Do you have the pads on your knees holding you down? That will allow you to focus the movement on using your back muscles only and not momentum.